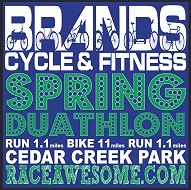 Subject: LongIsland.com - Your Name sent you Event details of "5th Annual Brands Cycle & Fitness Spring Duathlon"
The 5th Annual Brands Cycle & Fitness Spring Duathlon will feature 2.2 miles of running and 11 miles of biking at Cedar Creek Park. isit the attached website for registration details. Visit the attached website for registration details.